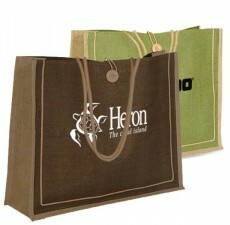 Available in 5 bold colors our Promotional Jute Carry Totes are eco-friendly and reusable. Your next marketing event is guaranteed to be a success with these bags at the center of the action. Promotional giveaways don't have to be a hassle, with our easy to order process you can check out our bags and have them at your event on time! As the world becomes more eco-friendly your customers will be glad to know that you and your company are leading the way in being green and saving the planet. Order your Promotional Jute Carry Totes today and make your marketing event a success!